The Supreme Court has smacked down a major challenge to the Affordable Care Act, one that could have caused millions of Americans to lose health insurance coverage. In a 6-3 decision, they ruled against the plaintiffs in King v. Burwell, who argued that the federal government couldn’t provide subsidies for health insurance in states that didn’t establish their own insurance exchanges. 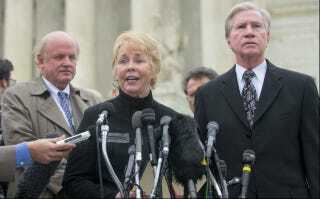 Three of the four plaintiffs are nearly eligible for Medicare, meaning their objections to Obamacare will soon be moot. Two of them appear to qualify for hardship exemptions—that is, they are not forced to acquire insurance or pay fines because even with a subsidy insurance would eat up too much of their incomes—so it’s unclear how Obamacare had burdened them. These two plaintiffs seemed driven by their political opposition to President Obama; one has called him the “anti-Christ” and said he won election by getting “his Muslim people to vote for him.” Yet most curious of all, one of the plaintiffs did not recall exactly how she’d been recruited for the case and seemed unaware of the possible consequences if she wins. Told that millions could lose their health coverage if the Supreme Court rules in her favor, she said that she didn’t want this to happen. In a democracy, the power to make the law rests with those chosen by the people. Our role is more confined—“to say what the law is.” Marbury v. Madison, 1 Cranch 137, 177 (1803). That is easier in some cases than in others. But in every case we must respect the role of the Legislature, and take care not to undo what it has done. A fair reading of legislation demands a fair understanding of the legislative plan. Congress passed the Affordable Care Act to improve health insurance markets, not to destroy them. If at all possible, we must interpret the Act in a way that is consistent with the former, and avoids the latter. Section 36B can fairly be read consistent with what we see as Congress’s plan, and that is the reading we adopt. Six million people aren’t losing healthcare coverage and Scalia is throwing a baby tantrum. It’s a great day.